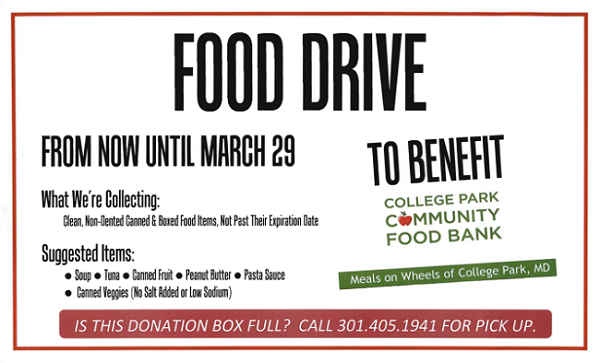 The University of Maryland’s Good Neighbor Day Event Planning Committee is organizing a non-perishable food drive that will take place between now and March 29th (Good Neighbor Day). They’re looking for locations throughout the campus and the city where they can place Good Neighbor Day food drive collection boxes. If you know of a suitable location, please contact Emily Adams of the University’s Office of Community Engagement at eadams@umd.edu or 301.405.1941. The Good Neighbor Day Committee’s efforts will help low-income members of our community who face food insecurity during the spring months, and are at risk of going hungry after the surge of food donations during the winter holiday season dies down.